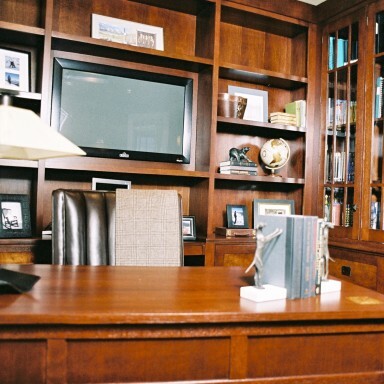 This stylish home office was created with the greatest attention to detail for this homeowner. The custom cabinets, designed by Patricia Conner Designs, were designed beautifully created in cherry with tiger maple inlay to perfectly integrate into the space. The hardware is Rocky Mountain. 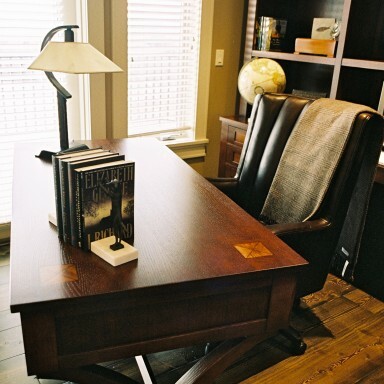 The leather desk chair and side chairs were purchased as were the accessories. Cherry wood with tiger maple inlay detail were specified to create this stunning office desk with a metal trestle and curved X leg detail. It has three drawers lined with leather. All designed and created by Patricia Conner Designs. The leather office chair and two side chairs are purchased as are the accessories. This bespoke office cabinetry with open shelving and lower file system was built in cherry wood with tiger maple inlay detail. The leather office chair swivels for access to the computer station. The pulls are Rocky Mountain Hardware. Accessories are purchased.